Modern World History offers a comprehensive look at world history from the mid-15th century to the present. Thousands of subject entries, biographies, images, videos and slideshows, maps and graphs, primary sources, and timelines combine to provide a detailed and comparative view of the people, places, events, and ideas that have defined modern world history. Focused Topic Centers pull forward interesting entries, search terms, documents, and maps handpicked by our editors to help users find a starting point for their research, as well as videos and slideshow overviews to offer a visual introduction to key eras and regions. Comprehensive Coverage: With Modern World History, researchers can delve deep into their topics or examine different perspectives through event and topic entries, primary sources, images, videos, general and topic-specific timelines, biographies, original maps and charts, and more. Easy Access to Content: Featured content in Modern World History is handpicked by our editors to inform research and provide guided entryways into the database, plus convenient links to key areas are at the top of every page. Suggested Research Topics: Each Topic Center in Modern World History includes handpicked selections showcasing the best resources for each topic—including in-depth overview essays—providing guidance for research. Primary Sources: Modern World History includes thousands of primary sources, many with introductions that provide context and background—perfect for strengthening critical-thinking skills. Videos, Images, Maps, and Slideshows: Modern World History’s videos, images, original maps, and original, interactive whiteboard-friendly slideshows offer a fascinating visual introduction to key topics and themes, stimulating interest and providing convenient overviews and “lecture launcher” material. Biographies: Under “Featured People,” Modern World History includes helpful lists of Enlightenment thinkers, women in world history, Renaissance painters, and dictators and tyrants. Each list includes dates of birth and death, a brief descriptor of the person’s achievements, and a link to relevant search results. Controversies in History: Editorially selected pro/con articles on hundreds of controversies in history can be found in Modern World History, enabling researchers to grasp the essence and importance of every conflict and the reasons people debated them. Overview Essays: Modern World History includes substantial and thorough overview essays giving extensive background on relevant historical topics and eras. Book Chapters: Chapters from authoritative print titles written by noted historians complement the thousands of encyclopedia entries, biographies, definitions, and other resources Modern World History provides. Book chapters allow for original thinking and are ideal for an in-depth study of a topic. 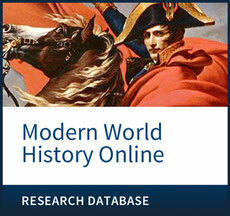 Authoritative Source List: Modern World History features a complete inventory, by type, of the extraordinary amount of expertly researched and written content in the database, including articles from a wealth of award-winning proprietary print titles, primary sources, images, videos, timelines, and a list of contributors to the database—information researchers can trust. - Educator tools, including advice on preventing plagiarism and using editorial cartoons in class.